The Home Vintner Wine Guild is a group of wine lovers who make their own wines. Bi-monthly we get together and bring a sample or two of the wines to a meeting. 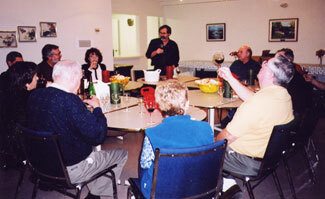 We then sample and review the different wines, as well as socialize amongst friends. The intent is to continuously improve our wines. The Guild also enters provincial and national wine competitions, which provide feedback from qualified wine judges, to further find ways to improve our wine making. We have, to our credit, 652 awards and medals for our wines! We also welcome beer at our meetings - more & more people are getting into brewing beer & judging and critiquing each other's brew is always welcome at our meetings. The Guild is open to any customer of The Home Vintner. If you are interested, please contact the store nearest you. Check our calendar for the next guild meeting. The Guild is now on Facebook. The Home Vintner is proud of its customer’s achievements in attaining 652 awards and medals in various home brewing competitions. We always welcome new members into our Wine Guild. We usually meet about once every two months to taste different wines (& beer! ), compare wines, teach you how to judge wine, discuss any new guild business, and socialize. It's a great way to try different wine & beer, and meet people who share the same interests as you! We also organize different field trips – some of which have been – a tour and tasting of Fieldstone Fruit Wines in the Strathmore area / a tour and tasting at Fallentimber Meadery in the Sundre area / a tour and tasting at Wild Rose Brewery, Calgary etc. Every summer, we have a BBQ and this year it is on Saturday, July 28, 6 pm-ish. If you are interested in this social evening, details can be found on our Events Calendar. We are currently gearing up for National Competition – our Guild members will be sending 17 bottles of the Provincial winners forward into the Nationals. Not bad, considering Alberta is only allowed to send 30 bottles in total! Deadline to have bottles to The Home Vintner Northwest Calgary store is August 4th.